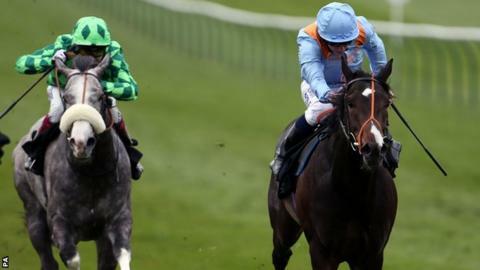 Unbeaten Toormore is on track for next month's 2,000 Guineas after winning the Craven Stakes at Newmarket for trainer Richard Hannon. Last season's top-rated juvenile, ridden by Ryan Moore, scored by two lengths from The Grey Gatsby. The evens favourite, Toormore clocked up his fourth success, with Godolphin's Be Ready unplaced. Toormore is rated between 4-1 and 7-1 third favourite, behind Kingman and Australia, for the Guineas on 3 May. Hannon holds a training licence for the first time this season, having taking over from his Wiltshire-based father Richard following his retirement. He made a big impact at Newmarket on Wednesday as supposed second string Magnus Maximus won the £100,000 Tattersalls Millions Sprint at 25-1, before 13-8 favourite Shifting Power landed the European Free Handicap by a head from Mushir. And Toormore brought up another double, with Spirit Of Xian getting up earlier on Thursday in a tight finish to the Maiden Fillies' Stakes.